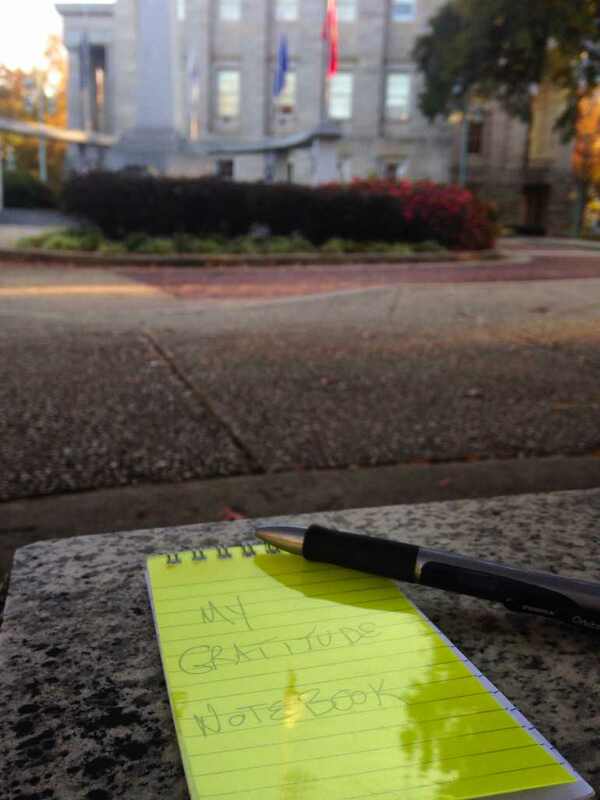 Since this is the season of giving thanks, I conducted a somewhat unconventional experiment this weekend, attempting to discover if an attitude of gratitude exists in our communities. 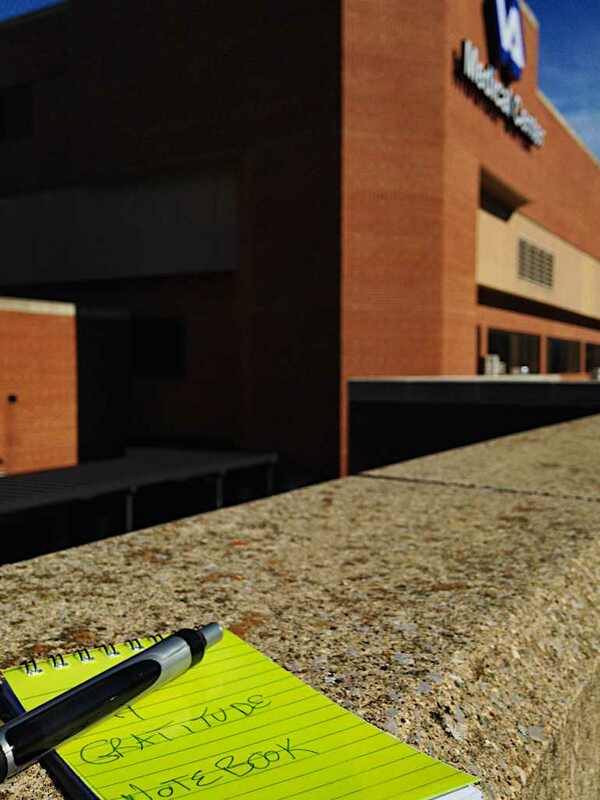 I wandered the streets of Raleigh and Durham, asking passersby to write in a notebook I was carrying. The theme: What are you grateful for? I took up my research at three locations. The students here were very willing write something in my Gratitude Notebook. Only one of the 11 people I asked said “no” to making an entry to it, citing the fact that he was running late. The theme of the gratitude among this college-age community clearly had to do with what lies ahead for them. The most unique addition to the notebook was from David. “I am grateful for an eternal perspective,” he wrote. This group was certainly looking ahead. It was a conscious choice to go on Veteran’s Day. I expected to be astounded. I was, but not in the way I imagined. Most people declined to write in my notebook at this location. Many professed to be late, in a hurry or just not interested. A group of construction workers I approached initially said, “I don’t think so. It’s been a tough week.” Among the people who did take the time, there was an obvious, but different, theme to the responses: The Present. “Grateful for the day.” – Dan, one of the construction workers who did speak up. My final stop was the busy State Capitol at the end of the work week. There was a good cross-section of people. Some walking alone, others not. Some young, others not so. Most, no doubt, heading home. Surprisingly, there was a theme here, too: Family and Love. “Health.” “Peace.” “Family.” – Marjukka, Chris, and Crispin, walking together. RELATED: #GivingTuesday: The Idealist’s Answer To Black Friday. What did I derive from my (unscientific) research? Gratitude comes easy, if you say “yes.” Those who agreed to my request, took my pen and immediately started to write. No hesitation. Our present situation influences our focus. We can, and should, be thankful for what lies ahead, thankful for the moment and thankful for the people that brought us to the here and now. Don’t wait to show your appreciation. My guess is that those who turned me down, probably did have something come to mind as they walked away, but they missed an opportunity to share it. I consider myself a grateful person. 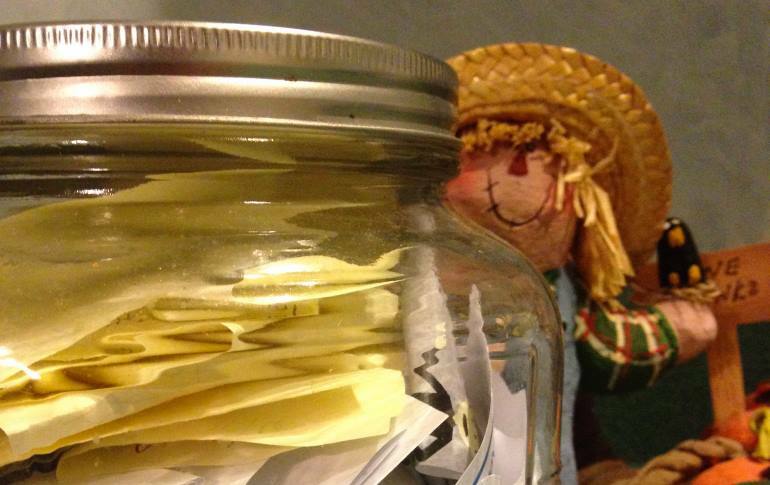 My family and I have instituted a “Gratitude Jar” to build the habit being thankful. Each of us tosses a dated, handwritten note in the jar each time we’re moved to do so. On New Year’s Eve, we open the jar, read them and reflect on the abundance that the year has brought. If you could take a moment and write what you are thankful for in the comments below, I’d be grateful.